View of Buttermere lake in Cumbria, Northern England. 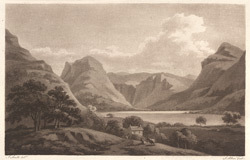 W. F. Topham in his 1869 book ‘The Lakes of England’, writes the following words about the lake, “ [it] is a small lake not exceeding a mile and a quarter in length, and about half a mile wide, but its chief beauty consists in the bold and rocky mountains which encompass it in on every way, except toward the north west, where the valley opens into an extensive and beautiful plain, in which are spread the blue waters of Crummock. The vale is beautifully wild, and is encompassed by magnificent hills”.